At Beauty Skin Laser in Homestead, we use only the most advanced lasers and technology and have multiple lasers to treat all skin types. In our office, you can feel secure knowing that you are getting the safest, most state-of-the-art treatment, with the best possible results. At Beauty Skin Laser we use Cutera and Syneron-Candela lasers for hair removal. They are the most gentle lasers available for hair removal. 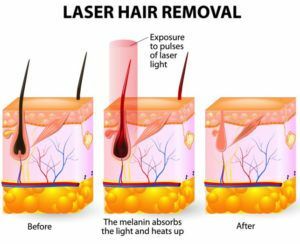 People are often amazed how little it’s hurt compared to their previous experiences with lasers and waxing. you will experience a sensation often described as a “hot pinch” or “snapping” feeling. The sensation only lasts for a fraction of a second, and you may feel warmth or a tingling sensation for a short time afterward. For your convenience, we offer numbing creams and post laser topicals to reduce any possible irritation.